I won’t do my usual recaps for this show. Instead I will do my own version of Abby Lee Miller’s “Pyramid” after each episode. Abby ranks the 6 dancers each week from worst to best. My pyramid will rank the 6 most horrifying things that happen during each episode. From mothers cursing out the dance teacher to the dance teacher screaming about how she makes stars… there is a lot of inappropriate each week, but I’ll try to narrow it down to just six things each week. Check back here to see how things rank on my pyramid. “Nationals 90210” S02/Ep28 – Season Finale! Tune in next week for the Dance Moms Reunion Show! 7. Mom Christi coaching Chloe when she is trying to get the solo dance spot for Nationals. Sarcastically – You really just made me feel something. If you don’t care lets go home – I want you to want to win – I can’t want it for you. 6. Mom Jill coaching Kendall when she is trying to get the solo spot for Nationals. Kendall needs to realize this is important to me that she gets this solo. 5. Nia, Kendall and Chloe are pitted against each other to fight for the last solo spot. Abby tells them – these aren’t your friends, they are your competitors. 4. Paige is cast as the driver in the group number. AKA the kid who doesn’t do any dance moves. Another storm out by Kelly! 3. The moms vote on who should get the solo. That was an unpredictable vote! Can’t believe the moms voted for their own kids!! Abby gives Melissa the deciding vote. She picks Nia first saying she “deserves it.” Abby looked at her crazy and asked – who’s going to get us the most points? Melissa had to admit Chloe. Damn – she was so close to not having Chloe as competition against Maddie! 2.Cathy from Candy Apples is back! She is just bad behavior all around. Having her kids taunt ALDC, interrupting rehearsals so moms can confront Abby. Then Cathy calls Abby wide-load…to her students. And at the top of the pyramid this week, for most horrifying action by a Dance Mom or Dance Teacher Abby is…..
1. Abby;’s comments to Paige when Kelly is showing off her glamour, I mean modeling, shots… You are pretty Paige, but you need something to back it up. Pretty can go away – right Kelly? Kendall’s back on the team – we now have 7 spots on the pyramid! 7. Melissa, the ultimate stage mom. Making a “secret” meeting with a talent agency for her daughters. Good thing Christi’s “liar radar” went off! 6. Maddie doesn’t get a solo this week. Christi claims she feels bad for Maddie. Yeah right, you know she was toasting her next martini to No Solo for Maddie! 5. Abby’s a music video director too! Dragging the girls all around LA barking at them to look at the camera. She has a vision. She’s very talented. 4. Brooke’s embarrassing recording studio time. Stop. These girls can maybe dance. They cannot sing. 3. Abby makes Maddie beg all episode for a solo. She’s teaching her a lesson. What lesson is that? If you do what your mom says and not what I say, you don’t get a solo? 2. Abby quizzing Maddie and McKenzie about their trip to the agency — McKenzie gives her all the info. Abby tells them their friends don’t care about them and not to trust them. After high school they won’t care about you. Another lesson: Only care about yourself. 1. Melissa crying over Maddie’s solo and how beautiful it was. The camera catches her sucking up to Abby telling her she loves her and thanking her for making Maddie that way. Dear Melissa – the dance teacher doesn’t make your daughter. 6. Introducing – Kaya a new mom, and her daughter Nicaya. 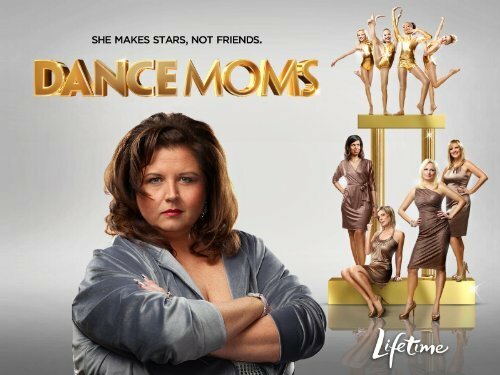 Mom’s another loud mouth which would make you believe she would fit right in — but the Dance Moms are not having a new girl who may take their kid’s lace in a dance. Jill is happy she’s not the “new mom” anymore. 5. Abby still hasn’t chosen who is in the group dance — even though she’s made everyone fly across the country to California… how does she solve this? Makes them “try-out” in the dressing room 5 minutes before they go on stage. Awww… she let’s everyone be in the group dance. She’s a great teacher. 4. Kelly storms out of rehearsal. It isn’t a rehearsal unless someone storms out! 3.. Kelly is trying to defend Paige to make sure she isn’t left out of the group dance. What does her BFF Christi say? I’m trying to block this all out – It’s time for Chloe’s solo! 2. Not that they are that different from any other week — but the tiny bra tops and booty shorts and messy bedhead up-dos… these are little kids!!! 1. Kaya the new mom vs. all the Dance Moms after the competition. She questions why Holly doesn’t have her back and Holly lets her know she is a doctor and she does not use her ethnicity as a reason to speak. Christi chimes in and Kaya tells her off “I’m not Doctor Holly, I’m from the ‘hood.” Then everyone calles each other the “b” word. Dance Education! 4. Mackenzie bursting into tears when she hears the other moms talking about her mom. 3. Yet another inappropriate screaming match between Abby Lee Dance Company and Candy Apples at a competition (No, not the kids, the adults.) How are these groups allowed to still compete with all these antics? 2. Christi and Melissa screaming at each other in the observation room — even the “sound-proof” window wasn’t enough for the screeching fight. And the top spot of the pyramid this week, the most horrifying action by a Dance Mom or Dance Teacher Abby is….. The bottom row of the pyramid – Jill really monopolized this row! 6. Jill’s outfit at the competition – a one-shoulder gray toned leopard dress.. oh my. No, Jill. No. 5. Sneaky Jill Part 1. Pretending to care out Paige having a broken foot, but really just weaseling information out of her to see if Kendall can take her place in the duet. 4. Sneaky Jill Part 2. As Brooke is lying on the floor with a hurt back, Jill complains she should have pulled out of the dance sooner. Why? So Kendall could have danced of course! 3. Brooke is still lying on the floor, She wants to dance but her back is really hurting. Kelly doesn’t know what to do, as a Mom she doesn’t think she should dance. (She also doesn’t know who Anne Frank is.) Abby thinks Brooke is faking, that she knows the competition is tough and she doesn’t want to go out there and lose. Abby then calls Brooke lazy. 2. A screaming fit starts when Abby asks Maddie to run her Drop Dead Diva choreography in the dressing room after the competition. Christi calls Abby out on this and they start to go at it. Abby calls Chloe a sneak, multiple times. Sneak. Sneak. Sneak. Sneak. Sneak.